Cuddle Lake outpost is an adventurous persons dream. 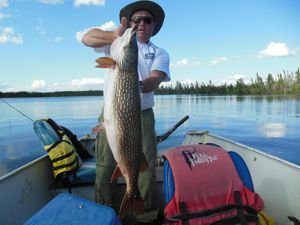 This long lake offers everything a fishermen looks for in a trophy Pike lake. The spring torrent of incoming and outgoing water from the Utik River breaks up the ice in the bay first, which is where the camp is positioned bringing with it thousands of baitfish and feed for the resident trophy pike and Walleye that have gathered for this once a year feeding frenzy. This lake is known for producing double header trophy northern pike between 41" to 52 " in Length. I now have exclusive rights to Pritchard Lake, which is just west of Cuddle. Pritchard Lake flows into Cuddle via an impressive set of rapids at the far west end of Cuddle. There are three boats and a tent camp set up at Pritchard Lake. Cuddle guests will have access via a portage trail. Future guests will have endless fishing opportunities between these two lakes and rivers. The cabins at Cuddle were treated to an extensive renovation this past fall. A new large deck was added to the large cabin. Repeat customers will note many other improvements to the cabins, such as a wall moved within the large cabin to make room for a living room/lounge area with couches, etc. In the spring, the fishing in the Utik River is tremendous both up and downstream. When water levels are normal, you can head downstream to the East all the way to the scenic Annesley Lake. Heading west you will have the chance to investigate the remaining 20 miles of bays, islands, and creeks in the lake. Cuddle Lake has had virtually zero fishing pressure by sport fishermen in the last 20 years. There are sure to be records that come out of this lake in the future.